Ever since the earliest days of tanks and armored vehicles, special radio communications variants have been produced. After all, communication is, perhaps, the most important aspect of any military operation. Whether between infantry, airforce or armor, communications are key to a successful operation and maximizes coherence between various units. The earliest of these vehicles was the ‘Wireless Communications Tank’ based on the British Mk. I tank used in the First World War. In the Second World War, more appeared such as the German Kleiner Panzerbefehlswagen based on the Panzer I, and the Japanese Shi-Ki based on the Type 97 Chi-Ha. In the Korean War (1950-1953), communication was key with Allied forces spread all over the ‘Land of the Morning Calm’, as it was called by the Korean people. With friendly forces always on the move, units realized there was a need for compact and mobile radio communication stations. By the time of this War, the Medium Tank M4 was a largely outdated and plentiful vehicle to base such a vehicle on. This conversion became known as the ‘Porcupine’ after the multiple antennae that protruded from the tank. It was an extremely rare vehicle, and it is believed that only two to five of these field-conversions were produced. By the time of the Korean War, the M4 series had evolved into its final form, often referred to as the M4A3E8. To the Marines in Korea, they were known as the “Old Reliables”. Entering service late in the Second World War, this model featured an improved Horizontal Volute Spring Suspension (HVSS) that replaced the iconic Vertical Volute Spring Suspension (VVSS) of earlier models. This suspension allowed for a wider track, improving grip and lower ground pressure on softer ground. Propulsion was provided by the Ford GAA all-aluminum 32-valve DOHC 60-degree, 525 HP, V8 gasoline/petrol engine. This could propel the tank to a top speed of 40 – 48 km/h (25 – 30 mph). Armor on the vehicle was up to 76 mm (3 in) thick. The tank had a crew of five, consisting of a commander, driver, co-driver/bow machine gunner, gunner, and loader. Although a large number of the newer, 90mm gun armed M26 Pershings and M46 Pattons were dispatched to the Korean Peninsula, multiple variants of the E8 were also used in the Korean War. 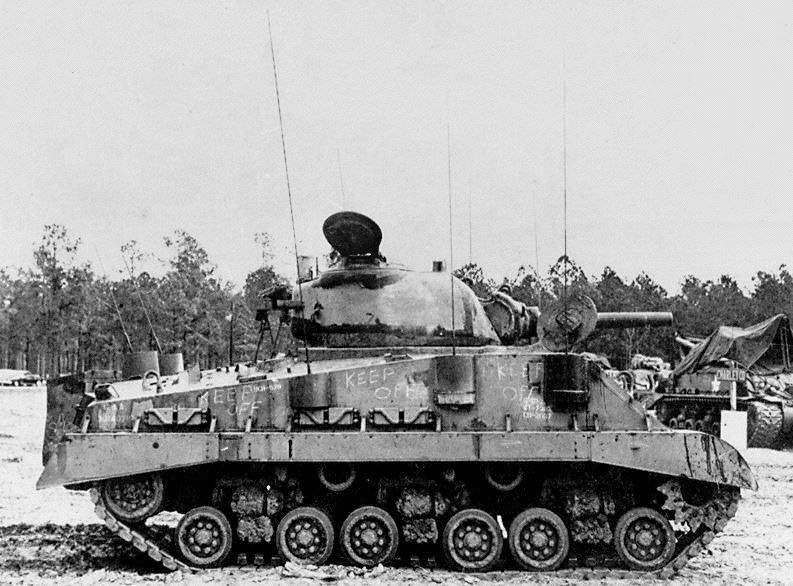 These included the regular M4A3(76)W HVSS, which was armed with the 76mm Tank Gun M1A1 or M1A2, the M4A3(105) HVSS, armed with the 105mm Howitzer M4, and finally, the POA-CWS-H5. This was a specialist version armed with both a 105mm Howitzer, and a coaxial flamethrower. It would appear that every one of these converted M4s were 105mm howitzer armed M4A3(105) HVSSs. This highlights an interesting choice as there were not that many 105mm howitzer armed M4s deployed in Korea. There are few viable arguments to suggest why these tanks were used though. In the Second World War, most M4 105s did not have power-traverse or elevation gears. By the time of Korea, these gears were added to most of the Howitzer M4s, but not all. This made the M4 105 turret extremely roomy, with more that enough space to add extra radio equipment. There is an element of redundancy in this argument however, as the August 1948 “Medium Tank Status” report stated that there were 1398 M4A3(105)s with HVSS and power traverse in the Army’s Inventory. An additional 521 M4A3(105)s with HVSS, but without power traverse were also listed. It is likely that the US Military would’ve prioritised the updated 105s, and taken them to Korea, albeit, in very small amounts. However, another theory suggests that it was simply a matter of availability. 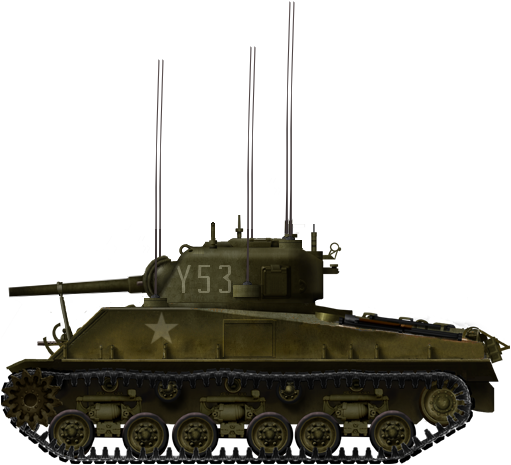 In reality, the turret of the 76mm gun armed M4s was the larger of the two. 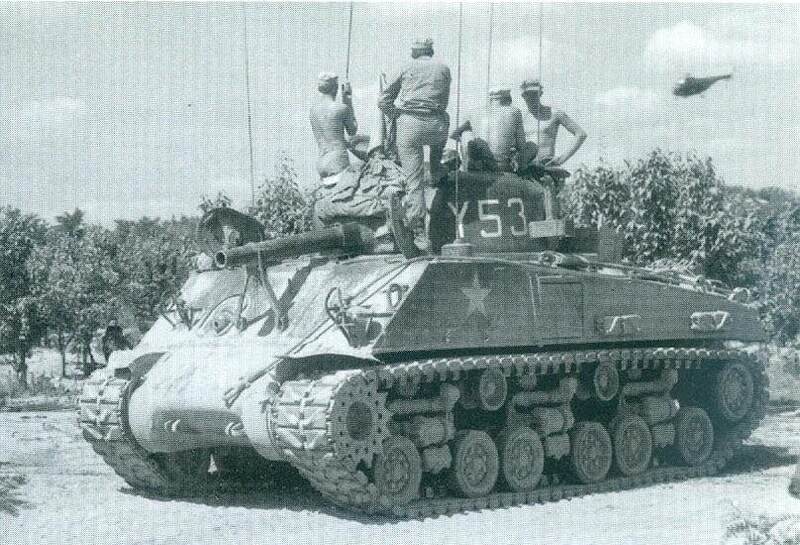 M4A3(105) tanks would have been a logical choice as there was a potential surplus of the vehicles that would’ve have been available for conversion to utility vehicles such as this. This is possibly the most likely reason behind the vehicle choice. ‘Porcupine’ Y53, Korea 1952. Illustration by Tank Encyclopedia’s own AmazingAce, based on work by David Bocquelet. The above image and following information was provided by the “Sherman Minutia” website. The photo shows one of the Communication Tanks and two M4 Dozer Tanks of the Provisional Tank Platoon on November 19, 1950, navigating the hazardously narrow road near the Funchilin Pass which was the 1st Marine Division Main Supply Route (MSR) to the Chosin Reservoir. 1, 2 & 3: At first glance the Communication Tank appears to be a conversion of a rare M4A3(75) HVSS tank due to the standard 75mm mantlet visible (1), but closer examination reveals the canvas mantlet cover attachment points (2) and the gun travel lock mounted lower on the glacis (3) both of which are characteristic of 105mm armed tanks. All of the Porcupines had dummy guns in an effort to look like regular gun tanks. To be precise, only the breech and other internal components were removed. The actual barrel of the gun remained intact and was fixed in place, either permanently resting in the travel-lock or rigidly facing forwards. The extra internal space was used for installing map tables and additional radios. All other armaments, such as the coaxial and bow-mounted machine guns, possibly even the cupola mounted .50 Cal (12.7mm) were also removed. Making them difficult to distinguish from regular tanks was part of their protection. The enemy had a harder job identifying a command vehicle to knock out. 4, 5, 6 & 7: A number of external modifications were made to the vehicle. These include a handrail added to the side of the turret (4) and an armored door added to the side of the hull (5). A large antennae mounting bracket was added to the side of the turret (6), as well as other points on the hull, for instance next to the driver’s hatch (7). The arrangement and amount of antenna added to the tanks appears to be unique to each vehicle. At least one of the Porcupines had as many as eight antennae. The Radios added to the M4 were used for long-range communications. This included communication with Naval Vessels, aircraft, infantry units, and artillery batteries. A significant drawback of the high-amperage radios installed in these tanks was that they required a positive ground contact. As such, the radios could not be operated while the tank was on the move. When stopped to transmit, a steel stake connected to the earthing cable would be driven into the ground during operation. Radio equipment may have included the AN/VRC-3. The AN/VRC-3 was simply a vehicle-mounted version of the SCR-300 which had an approximate range of 3 miles (4.8 km). Looking at photos, at least one of the tanks used an AB-15/GR antenna. In reference to the fact that some of the vehicles were adorned with up to eight antennae, the tank acquired the unofficial nickname of “Porcupine” after the spine-covered mammal. Not much is known about the Porcupine’s career in the Korean War. It is hard to say when exactly they appeared in US Marine Corps. One of the earliest reported sightings of a Porcupine was between the 14th and 19th November 1950. 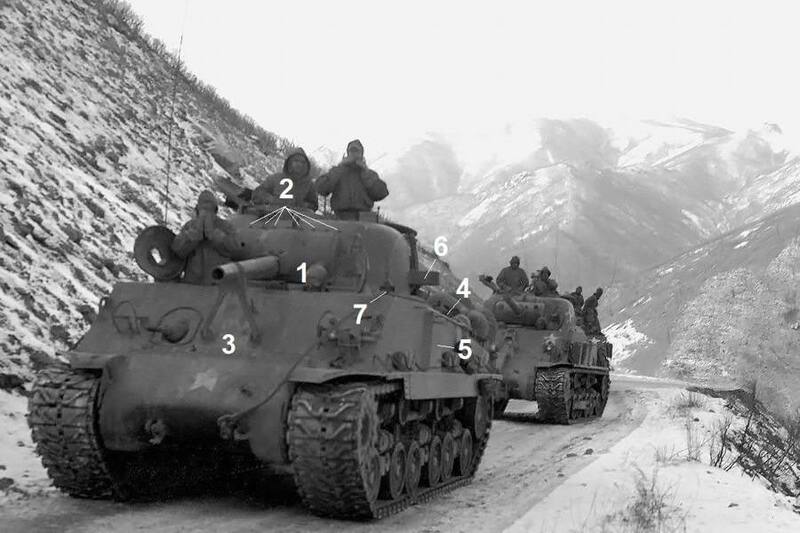 That night, a Porcupine with the designation ‘Y51’ was documented as passing along the Marine’s treacherous main supply route (MSR) through the Taebaek mountains, accompanied by the entirety of the 9-Tank-Strong 1st Marine Division Flame Tank Platoon, a command tank and a recovery tank of the Headquarters and Service Company, First Tank Battalion. In March 1952, the Marines began to relocate from the East coast of the Korean Peninsula to the West. To do this they would travel to the small port town of Sokcho-ri where LSTs (Landing Ship, Tank) were waiting to take them around the Korean coast to the Port of Inchon which had previously been taken earlier in the War. A Porcupine (ID number unknown) was recorded as being loaded onto an LST identified as No. 1138, with the nine tanks of the 1st Flame Platoon, three M4 Dozers and a Company of M4A3 (76) HVSS tanks of the Korean Marine Corps (KMC). The next known location of one of the Porcupines, identified as ‘Y53’ was south of Panmunjom, (the future site of the signing of the Korean Armistice Agreement) on 27th June 1952. Unfortunately, more is not known about this tank and its part in the Korean War. As it is an extremely rare vehicle, photographs and documented information are hard to find. It is highly unlikely that any of the vehicles survive today. An even rarer vehicle is the Porcupine variant of the Medium Tank M46 Patton. No pictures seem to survive of this vehicle, but there is a report of at least one in action as part of Operation Clambake on the Jamestown Line on the 3rd February 1953. The tank was under the command of Captain Clyde Hunter. It was equipped with six-radios. Brian Branson, US Military Radio enthusiast. Presidio Press, Sherman: A History of the American Medium Tank, R. P. Hunnicutt. With all those extra radios, there must have been a requirement to carry an extra 5-Gallon can of GAABS Squelch Grease ? As TC of a M551A1 General Sheridan ARAAV light tank during the Cold War in Germany, 1973-75, we always sent the new loader to ask the mechanics for some for our radio before a Border Patrol. SGT Maginnis, F/2/11 ACR.